Busy week. Busy. 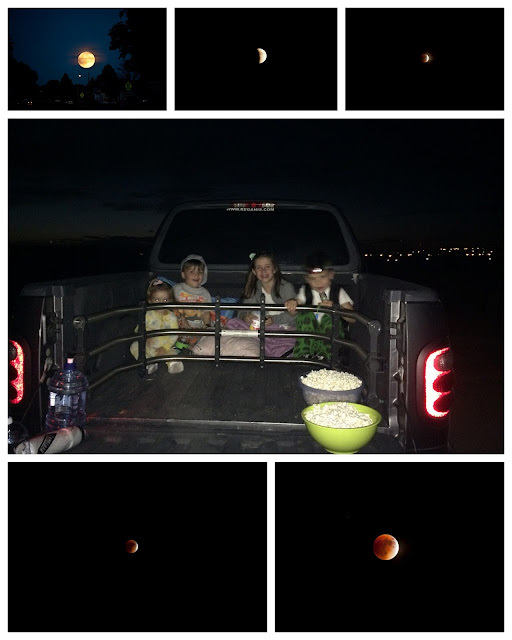 We kicked off the week viewing the Super Blood Moon Eclipse Sunday night. We rushed outside after dishes were done and laundry sorted. A huge orange moon hung close to the horizon with just a touch of shadowing on the left-hand side. The kids were highly motivated to get jammies on, grab blankets, make popcorn, and fetch water bottles to go out and watch the event. We piled into Justin's truck and drove out to the soccer fields, where the light is significantly darker. We all piled on the blankets and watched the moon slowly eclipsed by the Earth's shadow. If I could count the number of times the kids said blood or bloody I'd be rich! They were pretty excited to watch a bloody moon. Justin and I really enjoy listening to the kids chatter. Their misconceptions are pretty hilarious. I had the privilege of taking the boys to pee on the grass, earned a few goat heads in my skirt. Each day this week Evelyn (and sometimes Everett) and I head outside at 8:10 am to watch the marching band practice. Tuesday we followed the band for a couple blocks. Everett was inspired by the thumping drums, he told me his legs just could not stop marching. Evelyn's eyes light up when we hear the band start up. 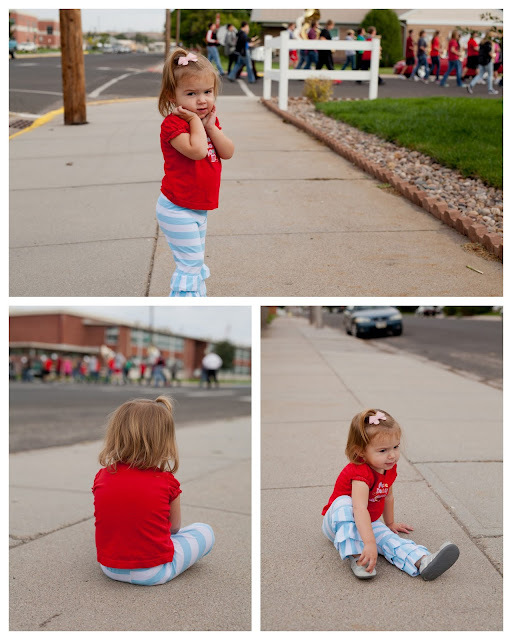 She is still a bit timid over the loudness of the band but enjoys watching them march away. When we can only hear drifts of sound floating around she busts out some cute dance moves. Monday morning was my 20 week ultrasound, I opted out of an early ultrasound even though I am "old." Evelyn trotted into the hospital toting her baby otter in a purse, she stuffed crackers and lollipops next to the sweet otter. Gotta have standards! Justin came with because he was afraid I would not tell him what gender this baby is. He might have a reason to be scared, heh, heh, heh. After a bit of deliberating looks like this new baby will be a girl, pretty high chances. She looks relatively healthy, as much as can be seen on ultrasound. At one point the tech said it looked like the baby was licking the umbilical cord. We all had a good laugh over that. She is a mover. I wanted to surprise the older kids after school. My dang head hurt so bad I nearly cried. I tried to do black balloons with pink glitter, but as soon as the balloons were inflated you could totally see the color. Grrrr. Both boys guessed before I finished inflating the balloons. They told Amelia on our way home from ballet. So much for surprising. All the kids wanted a baby brother! Justin popped the balloons over the kid's head just for fun. 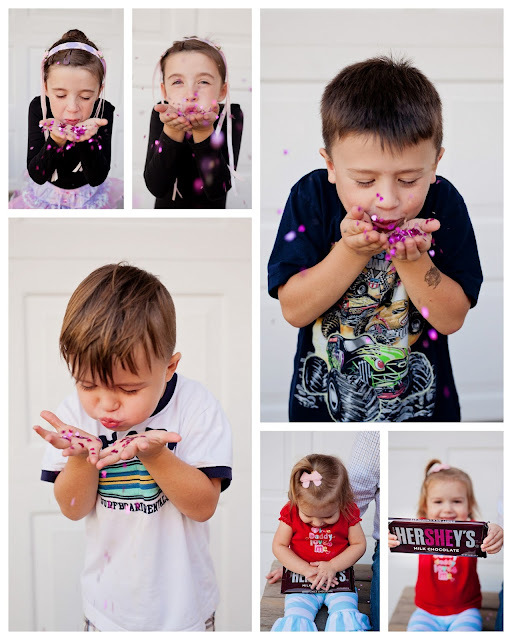 They had fun playing with the confetti and chocolate bar. Yay, we are excited to welcome a girl into the family. Phillip has added this to his daily prayers, "Please bless mom to have a newborn on Valentime's Day." Bless his little heart. I finally caught a video of Evelyn fake burping and saying, "me me" (aka excuse me). Atta girl. I guess having 6 brothers totally made me grow up thinking bodily functions are hilarious. Opposed to contrary belief Justin is not the culprit who teaches the kids to burp...it's me. Yeah, me. Everett got to meet Buck Wilder, a children's author from Michigan. He writes cute adventure books for kids, like how to fish, hunting, camping, boating, etc. Buck had all those 4 year olds riveted with his fun stories. He showed them how he writes a page for a book. He is famous for saying that an eraser is the best part of a pencil because we all make mistakes. We love going to story time every Thursday. The weather finally took a cold turn Friday afternoon. Just in time for Oktober fest. The weather is always miserable for General Conference. Maybe God is crying over all those folks drinking beer up at the beer tent. LOL. 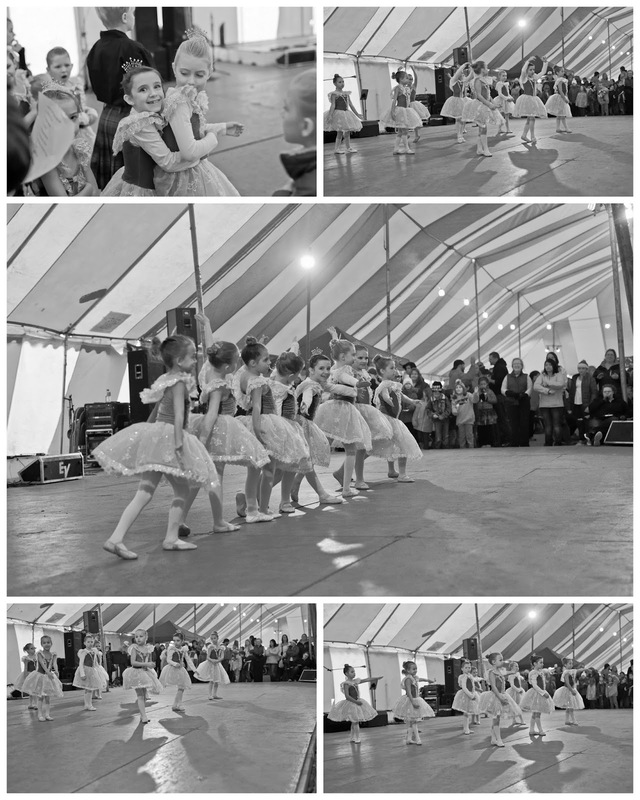 Amelia had a quick ballet practice after school because half of her class would miss the performance, Mrs Margaret had to reconfigure the dance. We were asked to ride on a float this year for the parade. 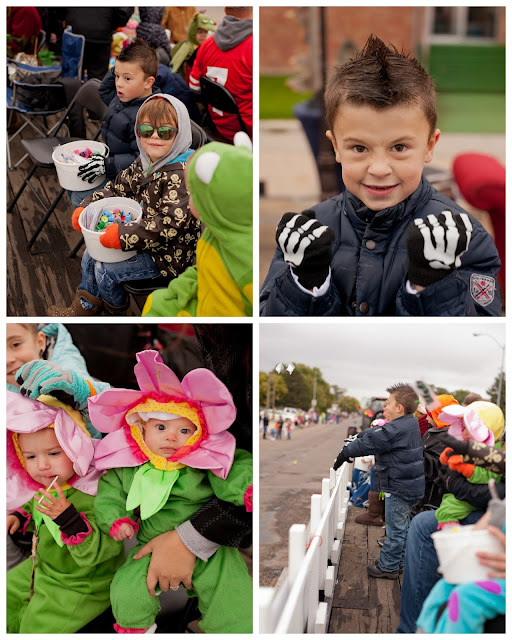 Jamie asked us to ride on her Daisies and Dragons float, the kids consignment store I frequent once a week. Evelyn got to dress up as the Daisy! Her friend Elliott was the dragon. Justin was grumpy that I said we'd help out. He even wore his grumpy beanie to make sure everyone knew he was not cool with the arrangement. I think in the end he enjoyed sitting with the boys. Everett wanted to be cool for the parade, so donned a shamrock necklace, mirror shades, and cool pants. Amelia styled his hair. He looked cool. Phillip requested a Mohawk to accompany his double layered shirts, two pairs of shorts, and jeans. He originally wanted to flip his top shirt up to surprise everyone with the bottom shirt. It turned out to be way to cold for that trick. We shivered for a good hour before we made our way down Illinois street. It was a frosty 44 degrees outside with a mist and light wind. Brrrrrr. 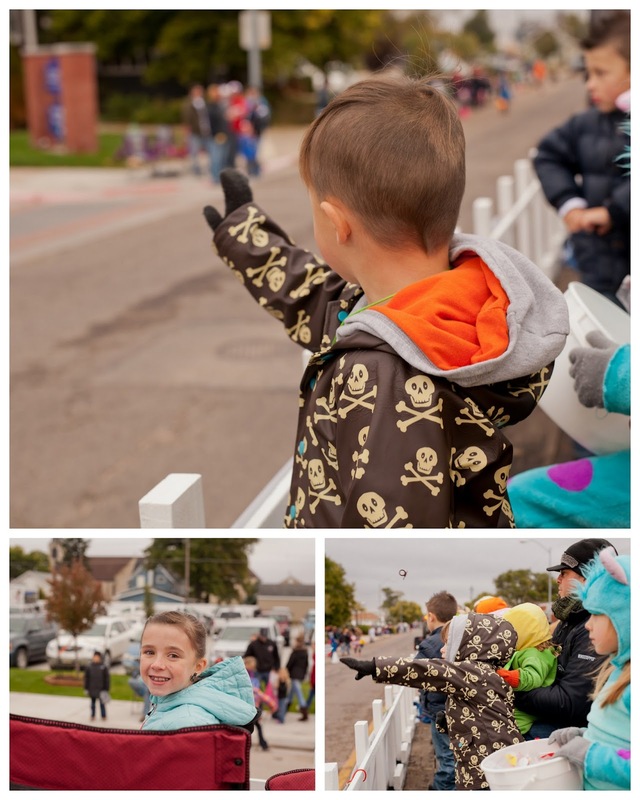 All the kids loved throwing candy and waving to all their friends. 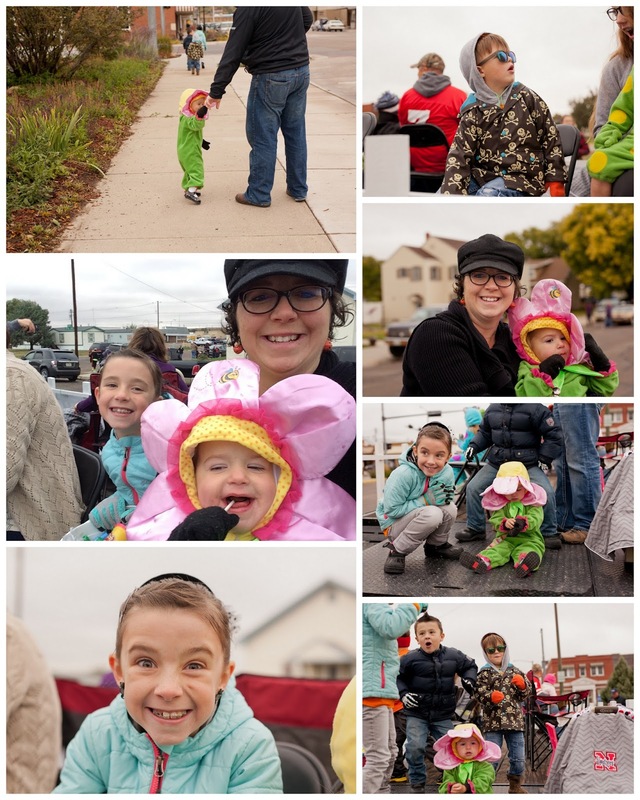 Evelyn enjoyed sneaking candy during the parade. We made it home in time to hear the last couple talks of the first session. Right after the session was over I helped Amelia into her ballet costume and makeup. We had brats and sauerkraut at the beer tent for lunch then watched Amelia perform with her class (in the beer tent). She lead the dance, with most of the girls watching her for ques. She is so darn cute! I loved Elder Holland's talk on Mothers. "No love in mortality comes closer to approximating the pure love of Jesus Christ than the selfless love a devoted mother has for her child." Several other talks focused on mothers and parenting. I was glad to hear their counsel. It also seemed many of the talks were directed at standing up for truth and righteousness when popularity pulls the other way. The kids were dully impressed as 3 new apostles were called. Our new apostles are Elders Rasband, Stevenson, and Renlund. 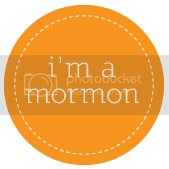 As our prophet spoke Sunday morning I felt an urge to help him stand up as the pressures seemed to weigh his shoulders down. He has devoted his life to God, it shows. I can't wait to help our family "ponderize," 80% extended pondering, 20% memorization of weekly scriptures. We made play dough the night before, 6 fun colors, to help keep the kids focused during conference. It worked for a little while. Mostly the boys played in the now empty craft/guest room. They had a grand ole time playing drum set. Hoping our new egress windows will be installed starting tomorrow morning. Justin hung plastic from ceiling to carpet around some of the heavier furniture.